(Trent Nelson | The Salt Lake Tribune) Brigham Young Cougars center Sara Hamson (22) blocks a shot by Utah Utes center Megan Huff (5) as BYU hosts Utah, NCAA women's basketball in Provo, Saturday December 9, 2017. Provo • Junior guard Brenna Chase says the BYU women’s basketball team “is doing more rebounding drills than I have ever done in my life” in preseason camp as the Cougars prepare for the 2018-19 season. There are a couple good reasons for that. First, the Cougars will start the season without their only other returning starter, 6-foot-7 sophomore center Sara Hamson. 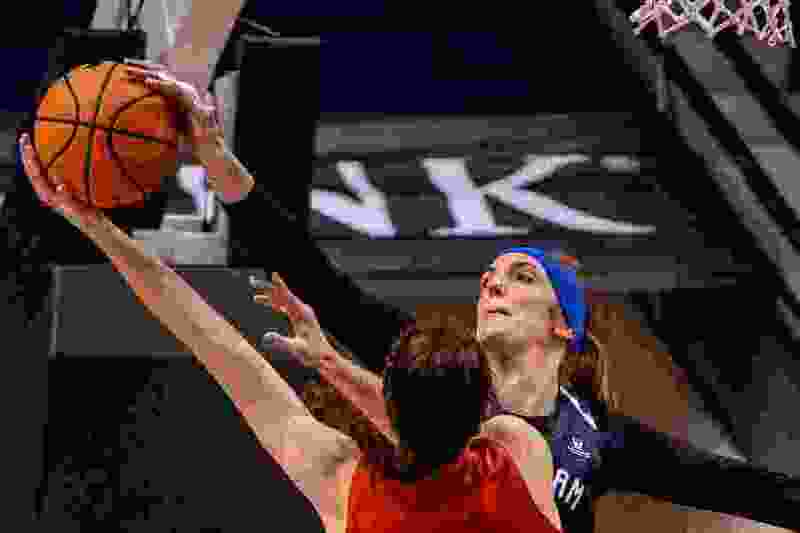 She was BYU’s best rebounder last season, averaging 7.7 boards per game, but sustained an ACL injury in early August while preparing for volleyball season and won’t return to the basketball lineup until December, at the earliest. Second, the Cougars were a bad rebounding team last season, even with Hamson in the lineup, and that shortcoming was especially evident when they were bounced out of the West Coast Conference tournament quarterfinals last March by San Diego. “Rebounding is definitely something we have to get better at,” said coach Jeff Judkins, who is entering his 18th season. As can be expected of a team that went 16-4 last season, 11-7 in the WCC, and returns just two starters, the Cougars will be young and inexperienced. But Judkins, Chase and 6-3 junior center Shalae Salmon said its not a rebuilding year. “We have a team expectation of us winning a WCC championship and hopefully getting into the NCAA tournament,” said Chase, a 5-9 junior from Thornton, Colo., who averaged 13.5 points a game last year. BYU is picked to finish third in the WCC this season, behind Gonzaga and Saint Mary’s, and Chase and Hamson were named to the preseason All-WCC team. The roster includes 11 underclassmen, including five true freshmen and three redshirt freshmen. Of the newcomers, Judkins is especially excited about 5-9 guard Shaylee Gonzales of Gilbert, Ariz.
“She is going to be a really good player,” he said. The only seniors are 6-2 forward Jasmine Moody, who missed last season with an injury, and Caitlyn Alldredge, joining the team this season after playing softball for BYU the past four years. Six players on the roster were born outside the United States. Three are from New Zealand, two are from Brazil and one is from Sweden. Tuesday — Dixie State (Exhibition), 6 p.m.
Friday — UC Riverside, 5 p.m.
Nov. 13 — California, 4 p.m.
Nov. 20 — at Utah State, 7 p.m.
Nov. 23 — vs. TCU at Viejas Arena, San Diego, 8:15 p.m.
Nov. 24 — vs. Cal Baptist at Viejas Arena, San Diego, 6 p.m.
Nov. 27 — at Southern Utah, 6:30 p.m.
Nov. 29 — at Utah Valley, 11 a.m.
Dec. 8 — at Utah, 7 p.m.
Dec. 15 — Colorado State, 2 p.m.
Dec. 29 — at Santa Clara, 3 p.m.
Dec. 31 — at San Francisco, 4 p.m.
Jan. 3 — Pepperdine, 7 p.m.
Jan. 5 — Loyola Marymount, 2 p.m.
Jan. 10 — at Pacific, 8 p.m.
Jan. 12 — at Saint Mary’s, 3 p.m.
Jan. 17 — Gonzaga, 7 p.m.
Jan. 19 — Portland, 2 p.m.
Jan. 26 — at San Diego, 3 p.m.
Jan. 31 — at Loyola Marymount, 6 p.m.
Feb. 2 — at Pepperdine, 3 p.m.
Feb. 7 — Saint Mary’s, 7 p.m.
Feb. 9 — Pacific, 2 p.m.
Feb. 14 — at Portland, 8 p.m.
Feb. 16 — at Gonzaga, 3 p.m.
Feb. 23 — San Diego, 2 p.m.
Feb. 28 — San Francisco, 7 p.m.
March 2 — Santa Clara, 2 p.m.